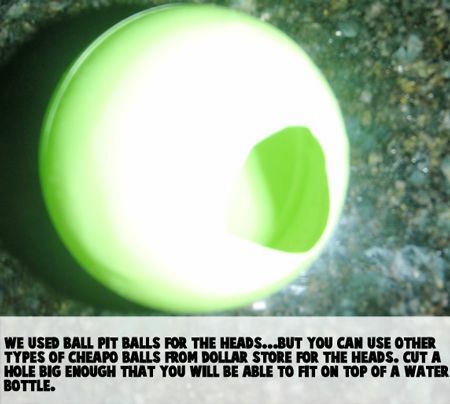 We used ball pit balls for the heads… but you can use other types of cheapo balls from the Dollar Store for the heads. Cut a hole big enough that you will be able to fit it on top of a water bottle. 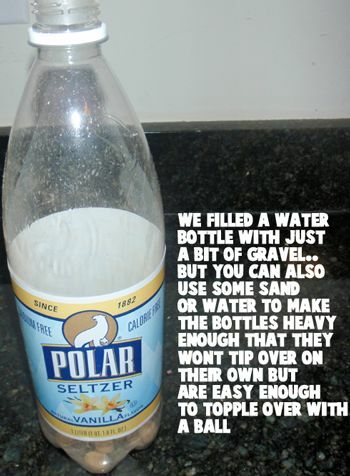 We filled the water bottle with just a little bit of gravel, but you could also use some sand or water to make the bottles heavy enough that they won’t tip over on their own… but are easy enough to topple over with a ball. 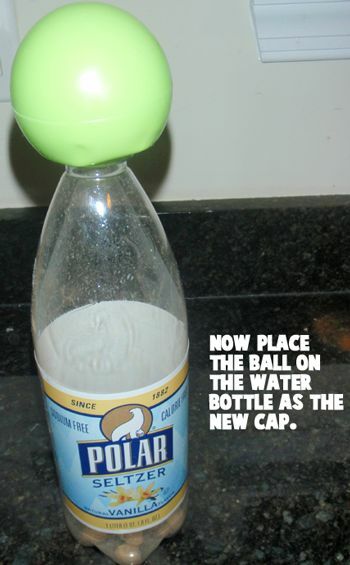 Now, place the ball on the water bottle as the new cap. 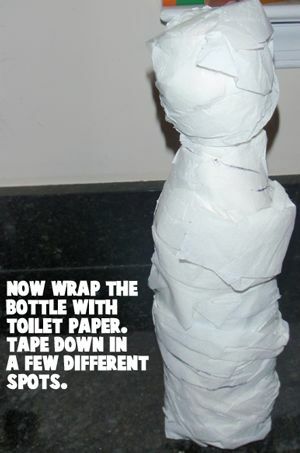 Now, wrap the bottle with toilet paper. Tape down in a few different spots. 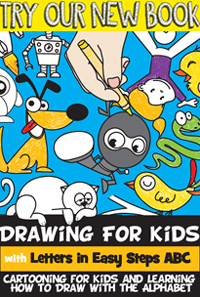 Draw the face. The mouth is just a line with lines thru it. 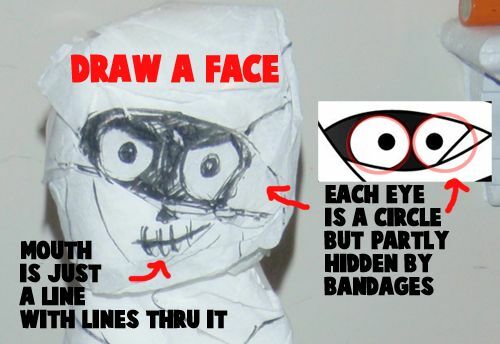 Each eye is a circle, but partly hidden by bandages. 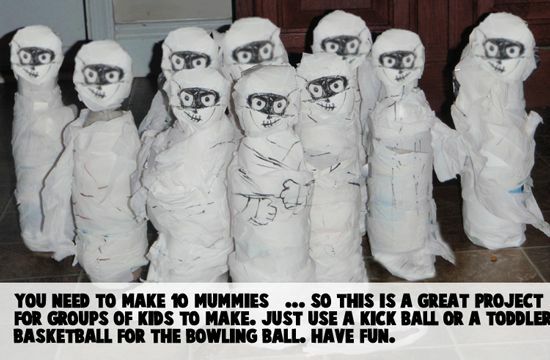 You need to make 10 mummies… so this is a great project for groups of kids to make. Just use a kickball or a toddler basketball for the bowling ball. Now, tell me that isn’t a great project for a Halloween party? I don’t know which will be more fun…. 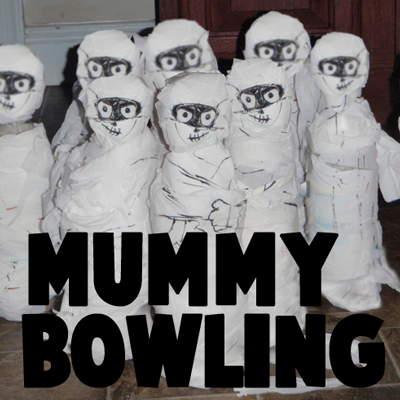 making the craft or playing Mummy Bowling. Have fun! !